Recent advancements in automotive industry, such as infotainment and Advanced Driver Assistance Systems (ADAS), have greatly enhanced the ease and comfort of driving. But at the same time these additions in consumer amenities has increased the vulnerability to their security and created numerous entry points for hackers, which is a major point of concern; sometimes result in recall of vehicles, loss of revenue, and also tarnished the brand image for many automobile manufacturers. Implementation of security measures to address these concerns in a cost effective way is a big challenge for OEMs and Tier 1 suppliers. In an effort to create a feasible solution to the aforesaid challenges for automobile industry, Microchip developed a new CryptoAutomotive™ In-Vehicle Network (IVN) TrustAnchor/Border Security Device (TA/BSD) development kit which enables OEMs and Tier 1 suppliers to introduce security to networked vehicle systems, starting in areas of priority, with the highest level of protection and without disruption elsewhere. 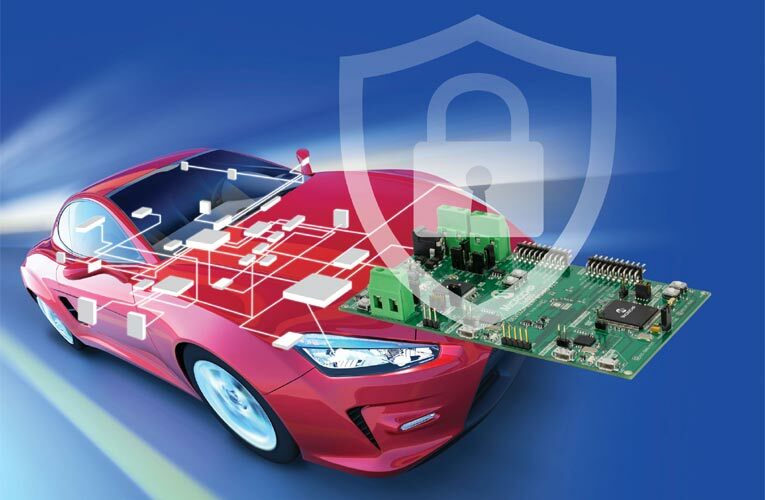 The only security-specific automotive tool in the industry, the CryptoAutomotive TA/BSD development kit emulates a secure node in an automotive network and provides system designers with an intuitive starting point to implement security. Moreover, this tool is designed to be flexible, accommodating each OEM’s implementation by allowing manufacturers to configure the node to conform to various specifications and industry standards. It features secure key storage, Electronic Control Unit (ECU) authentication, hardware-based crypto accelerators and other cryptographic elements. When used with a host microcontroller, it enables designers to implement functions such as secure boot and Controller Area Network (CAN) message authentication, including conversion of CAN 2.0 messages to CAN Flexible Data rate (CAN-FD) with appended Message Authentication Codes (MAC) when appropriate. With the companion approach, the TA/BSD emulation kit allows OEMs to continue using their existing microcontrollers (MCUs) and, more importantly, existing MCU firmware certified to required safety standards by later adding the companion chip the kit emulates. These companion chips will come to the customer preprogrammed and include built-in security measures to provide true hardware-based key protection. This add-on approach can remove the necessity of redesigning the entire system with high-end secure MCU, thus offering a significant cost and time-to-market advantages. The tool is compatible to be used with any ECU, architecture, configuration or bus, providing a great flexibility to implement security in existing systems without large-scale redesigns. In addition, the companion chip solution requires minimal MCU code updates, resulting in minimal to no impact to existing host MCU functional safety ratings. The tool provides an online Graphical User Interface (GUI) program with pre-configured options to simplify and facilitate implementation, removing the requirement for in-house security expertise. The CryptoAutomotive Security ICs TA/BSD development kit (DM320112) is available for $250.00.